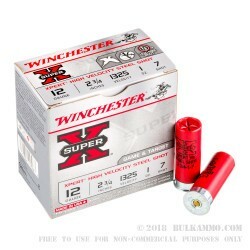 A nicely-sized case lot of 250 rounds of this very well-placed sport shooting shotshell that is offered in the Winchester Super-X line. 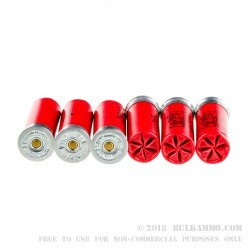 This is a 2 ¾” 1 ounce load that features a non-lead steel shot payload that is best suited for ranges where the preference is to shoot non-lead filled cups. These are also well suited to small game birds and waterfowl, when you can justify the #7 shot on short placements or for smaller targets in denser groupings. The speed makes up a bit for the lack of striking power that comes when steel is substituted for the normal lead payload. Yes, the #7 shot is small and can see some adverse effects with strong winds or just on longer range setups, but the load is overall quite a performance option with the speedy 1325 feet per second velocity and the nice quality of the hull and base (it is a steel, zinc coated base), which works well in semi-autos and all other types of shotguns. 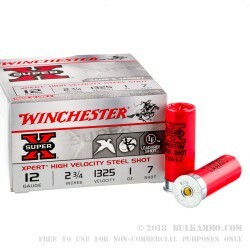 A lot can be understood by how the company and brand have performed over the long-term, and that bodes well for those who shoot or are considering shooting Winchester ammunition – with 150+ years of history in providing top tier ammunition for shotguns, rifles and pistols of all types. I depend on the in 7 shot 1 oz to shoot doves cleanly and ethically! This is a awesome round for Game and target! Get these they really work!